Posted on June 19, 2012 This might be outdated! I created a simple plugin called Easy WordPress Mailchimp Integration that simply adds a nice registration process to your Mailchimp mailing lists during WordPress user registration. Thats simple but so useful! You can customize the message that is displayed on the form registration, and well, that’s it! 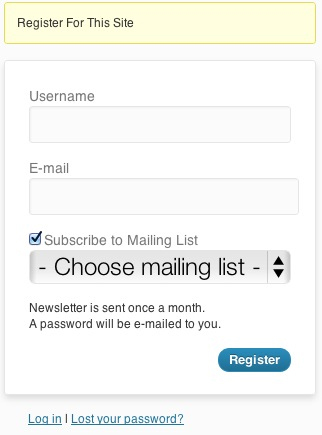 You can also view in users list users registered to one of your mailing list…. I hope you’ll like it! This could be a great plugin … but can you please add the option for “silent registration” – meaning bypass the double optin of MailChimp? Hi, the double optin can be configured directly into Mailchimp settings, and can’t be bypassed by third applications. Just go to your campaign settings and uncheck the corresponding option! I’ve got a mailchimp account and within a form with some fields (name, school, phone, address, …). Is it possible to fill in the mailchimp form AND also been registered to WordPress? Hi, with a little lines of code you could add this feature to the plugin, but this would be custom work. I have added your plugin and it works! The only thing is the first and last name fields are not forwarding to Mailchimp. The set up is pretty easy. Can you offer any advice or suggestions? Tks. Hi, yes i haven’t connected these two variables, i should have done it ! I’ll update the plugin with these new parameters but i can’t tell you when. For some reason my subscription list in Mailchimp is not being updated with a new subscriber. In Users, I can see a Yes under Mailchimp. I was trying other mailchimp plugins but deactivated all of them in case that was a problem but still it doesn’t work. Also, why doesn’t the default mailchimp list show on the Register page? Is there any way to make it show, given that I can get the plugin working? OK, I got it working. My bad. You’re welcome to delete my comments. But I’m still wondering how to show the default mail list on the Register page. Hi, you just have to select the default list under plugin settings. I’ve never heard of such a problem, let me know if it’s now working. 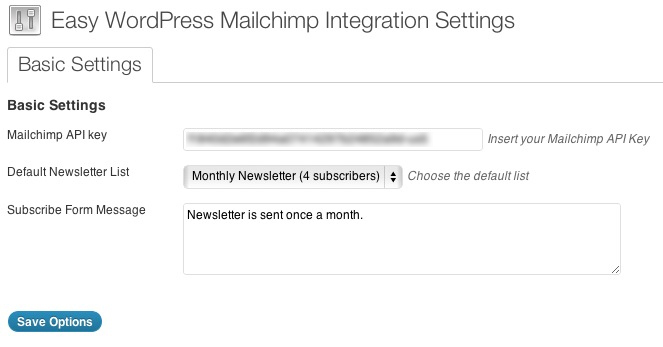 What happens if a user unsubscribes via Mailchimp newsletter? Can users unsubscribe via the WordPress admin panel? Cheers! Not for now but that would be a nice new feature to add! I’m probably doing something really stupid but I have activated the plugin on my site, added in the API so that I can see the MailChimp default list but I cannot then find a widget or another way to put the plugin on to my site, or have I completely misunderstood how the plugin works…? there’s no widget, actually you don’t have to anything else because the plugin on creates a dropdown list on the registration page, the default one. Try to logout from the admin, go to yoursite.com/wp-admin and click on “Register” (please make sure that registration is enable on your website), and when you’ll arrive on the registration page you’ll see the dropdown list. I have installed the plugin, added my API – cut and pasted from MC and my default list is not showing and if I try to save anything I get “cheatin eh?” message. When someone subscribes do they get the full MC registration form or just name/email – and if it’s just name/email how do I get the rest of the info from my subscriber. Hi, what’s your url ? I’ll have a look. Hi, the plugin doesn’t allow such thing, but you can easily add this witha few lines of PHP. is there any way you can help with it? Hi Astrid, you’ll need to modify the plugin core files to allow this. Maybe i’ll add this feature to a next update, but i can’t promise. Can you please tell me what what the shortcode is to add to the widget area? Hi Lauryn, there’s no shortcode in the plugin, it’s just creating a dropdown during registration process. Is possible modufy the plugin and have the ability for administrator to choose if the user can registrate 1, 2 or more lists? Great plugin for the mailchimp integration. I have a question though. Is there an easy way to allow people to choose which segment they want to subscribe too? I have 3 choices. Hi, you can simply propose to subscribe to your existing lists. Help?? Have I done something wrong? I’m hoping you can help me. On my site I have your plugin set up. You see the drop down and can select the mail list (I only have one) during registration. For some reason though the email is not being forwarded to my Mailchimp list. I have the API set up and I believe everything is done correctly. When I look at the Users list on my site I see the Mailchimp column and the Yes for users who signed up. Any idea why it wouldn’t be populating? Same request as Astrid. See string below please.